This project illustrates the importance of the equalizing thrust bearing system to the overall performance of the machine in which it is installed, as it truly is at the heart of the rotor system, especially in the case of vertical equipment. In mid 2011, technicians at Kingsbury's Repair & Service Division in Hatboro, PA were consulted by the owner-operator of a 40-year-old, 114.3 MW vertical pumped storage turbine-generator located on a major river in the southwestern United States. 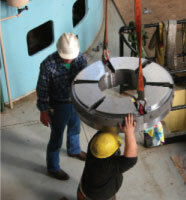 The combination thrust and guide bearing assembly was installed beneath the generator, with a separate guide bearing assembly installed on the turbine. The 76" diameter twelve-shoe thrust bearing was designed and produced by the original equipment manufacturer and featured a Kingsbury style, pin type, mechanical load equalizing system. By design, this thrust bearing support system automatically self-aligned the turbine bearing system and equalized the load on the individual thrust plates. During operation, the unit had been experiencing an issue with vibration levels generally characterized as "rough", with levels occasionally so high that they led to random shut-downs. Maintenance records indicated that there had been difficulties aligning this machine within the specification guidelines for quite some time. The operator suspected the bearing system was at fault, so during a scheduled outage at the plant, he contacted Kingsbury field service for an analysis to troubleshoot and provide corrective action. Disassembly and inspection of the thrust bearing showed evidence of binding in the mechanical equalizing system. The mechanical equalizing system consists of twelve lower leveling plates, which contact the thrust bearing base ring with a central rocking strip, allowing the lower leveling plates to pivot. There are twelve upper leveling plates installed above and between the lower leveling plates. The upper leveling plates are supported individually in a "wing-to-wing" arrangement by the adjacent lower leveling plates through the use of cylindrical pins. The wings of the upper leveling plates and the lower leveling plates are machined to form a slot for the cylindrical pin. A thrust shoe is positioned directly above each upper leveling plate and bears against it with a spherical contact. This system is ultimately intended to provide an articulated load path from the rotor to the bearing bracket. In this particular design, square section slots were used in the leveling plate wings, with clearance between the pins and the side walls of the slot. Markings on the cylindrical pins and leveling plate slot walls indicated the problem: random positioning of the pins, skewed pin arrangements and hard contact between the cylindrical pins and the walls of the slots. As a result, binding conditions were obvious. Further troubleshooting to support the theory of leveling plate/pin binding in the turbine bearing was the manner in which the bearing bracket had been adjusted in the past. The bracket was significantly out of level with "soft feet" conditions, and the grout beneath the sole plates (bearing bracket mounting) had also deteriorated. To correct the underlying problems, the bearing bracket sole plates were tightened and stabilized, while re-grouting activities were deferred to a later date. The bearing bracket was leveled and the individual bracket arms were uniformly loaded using new shim material. The cylindrical leveling plate pins were modified with circumferential grooves at each end for the installation of O-rings. The purpose of the O-rings was to act as elastomeric centering devices, keeping the cylindrical pins correctly positioned in the leveling plate slots. During the alignment phase of the project, the rotor responded well to adjustments that were made to plumb the rotor, which was an early indication that the pin modification was successful. Over the past year, another analysis shows a significant improvement in mechanical vibration and operational reliability. This project highlights why the thrust bearing is so critical to the overall healthy performance of the machine in which it is installed, as it truly is at the heart of the rotor system, especially in the case of vertical equipment.